I was a confident, conservative, reformed evangelical. Reformed protestants have a Calvinist bent in theology. I was married, with three incredible children, and very active in the church of my faith. 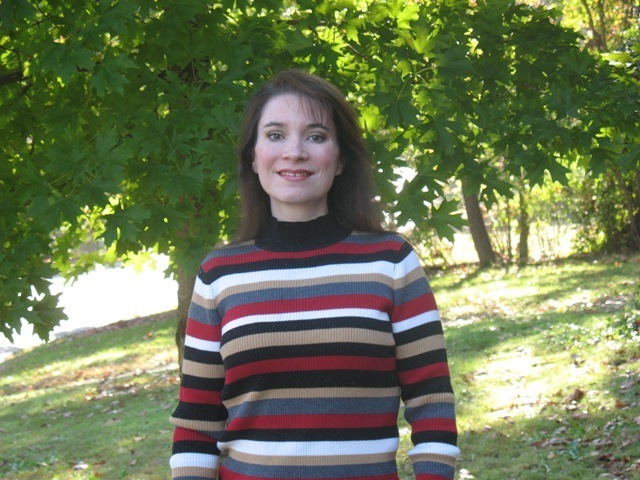 I taught Bible studies, was a mentor in our women’s mentoring program, sang in the choir, was a soloist, a member of a six person ensemble, and a violinist in the church’s orchestra. I was also a full time homeschooling mom. My oldest child, Dillon, wanted to be a concert pianist. He was only eight when he made that decision, but was extrememly gifted. He was currently taking piano lessons from a professor at a university in the next city. I began to pray about what to do for my precious son. We lived in Arkansas, which is not a mecca of classical music opportunities, and I needed direction. A few weeks later his teacher informed me that Dillon needed a more advanced teacher. I disagreed. She was a piano professor. How much more advanced could we get? She explained the differences in levels of pedagogy, even at the collegiate level, and told me that in six months to a year, she would no longer be qualified to instruct Dillon and he would get frustrated with his lessons. She recommended a colleague of hers and told me he was really the only option for my son. There were a few obstacles she warned me about. First, he rarely takes children. Second, he is known for being a monster to his students, and third he is very expensive. I started with the third obstacle. When I found out the price I decided then and there I couldn’t do it. The cost of piano was solely my responsibility and I had very few resources. When Dillon was five I asked my then husband if he could take piano lessons. He said yes, only if I paid for it myself. It was not to come out of the household budget. So, I started tutoring math and freelance writing. That worked fine when the lessons were $20 an hour, but now, if we switched to this new teacher, they were going to be $60 an hour, and his sister was now old enough for lessons as well. I had no idea how to afford it. But, I figured it might not even get that far given the first two obstacles. Because of the cost issue, I made the decision to stay with his current teacher for as long as it seemed useful to Dillon and then worry about switching. Sure enough six months later, Dillon hit a wall. He was frustrated with piano and his lessons, and his teacher reminded me it was time for a more advanced pedagogy. As it happened, Dillon was in a piano competition at a local University and we met the professor his teacher wanted us to transfer to. A few weeks after we met him, we decided to attend a public concert in which he was performing. I agreed and hurdle two was over. For the last hurdle, I doubled the number of tutoring students, and took a job proof reading a magazine from home. All the hurdles were cleared and we settled in to new lessons. Life was moving along as comfortably as I thought possible. Then three things happened which turned my world upside down. First, we discovered Neil was Mormon. Secondly, my family came to love him greatly. Thirdly, my conscience would not allow me to care about someone and not discuss eternity with them. You see the church I attended taught that Mormonism was a cult, its members deceived and condemned to an eternity in hell. How could we say we loved this man, and just sit back while he goes to hell? It was a real struggle for me. Now it shouldn’t have been that hard to talk to someone about eternity, but I was afraid he would get angry and stop teaching Dillon. We became dependent on his teaching. Dillon was blossoming under his tutelage, and there wasn’t another teacher within a two hours drive that was even close to his capabilities. The fact is Neil has quite a temper. I was afraid Dillon would lose him as a teacher. Pretty sorry excuse, I know, but it felt very real to me. Dillon means the world to me. I didn’t want to do anything that would hurt his future. So, I wrongfully put off the conversation. Soon I was pregnant again, and all thoughts of Neil’s eternity conveniently went out the window as I made preparations for our new arrival. During that time, our friendship with Neil grew. We regularly had outings together, and my conscience began to bother me almost continuously. Soon after my fourth child (which we named after Neil) was born, I began studying about Mormonism. I checked out every book our church library had on the subject, and borrowed a few from one of our pastors. The more I read, the more frightened I became for my dear friend. I would weep on my bed and pray for Neil. It seemed so awful, so satanic, so deceptive. I could not sit back without any attempt at rescuing him. So, I set an appointment for the dreaded conversation, deciding that if Neil got angry and dropped Dillon, perhaps God would look mercifully on my dear child and move another qualified teacher into the area. When the night for our conversation finally arrived, I tried to get my husband to go in my stead, to no avail. So, I packed up my little Neil and drove to his namesake’s home. It was the longest drive of my life. I had a basic plan, but was still not completely sure what to say. Bringing a peace offering of homemade chicken pot pie, I made him eat it before I brought up Mormonism, hoping he’d be more pleasant on an full stomach. When he finished eating I took a deep breath and asked him why he thought Joseph Smith was a prophet. He responded, “Because he is.” We bantered back and forth for a while, with me trying to explain some of the things I’d read and attempting to show him from Scripture where it was wrong. But, each time he cut me off. Aside from the slight dig on my intelligence, I had to admit he was right. It was not an honest way of investigating something. I told him I would investigate further, using actual Mormon reading material. At that moment his doorbell rang and two female missionaries entered the room. Neil explained they were going to be meeting with someone at his house, but it would not interrupt our conversation. He then told the ladies why I had come. I was already feeling pretty stupid, and now I had two missionaries in the room. They offered me a Book of Mormon, which I accepted. I then packed up my sweet baby and took off out of that house as fast as I could. If the drive to Neil’s house seemed long, the drive home was even longer. I now had to face my husband Brent and explain that not only did I not convert Neil, but that I agreed to read the Book of Mormon. I was pretty sure that would not go over too well. I was right. Brent was furious and told me that book was not staying in the house. I tried calming him down, by telling him I knew it was a false religion. But, I explained, the only chance we have of helping Neil was by using his literature. I also said that truth has nothing to be afraid of. If what we believe is true, then this will only serve to display that truth more readily. He calmed down and agreed to let me read it, only to show Neil where it violates the Bible. That process both destroyed my life and saved it. I began a three year journey that ended in excommunication from my former church, ostracism from every friend, a divorce after an 18 year marriage, and loss of all means of financial support. The day after I received my Book of Mormon I began studying it. I would set aside one to two hours each day to read it and compare it with the Bible, writing down any questions or what at first appeared to be contradictions. Then, each Thursday evening, after my children’s piano lessons I would sit down with Neil, their teacher, and ask my questions. The first thing I remember was that the Book of Mormon was not what I expected. It was much more in line with the Bible than I thought it would be. Although, I couldn’t understand how it could have been so much more specific than the Bible. The skeptic in me decided that Joseph Smith was just taking information from the Bible and writing a “New” testament, until I read the story about Joseph Smith’s reaction when Martin Harris lost some of the manuscript translations. I then realized that he was no scam artist. He truly believed everything he was writing was true. That left two options: Either Mormonism was true, or it was a cleverly designed scheme of Satan. I had to know which. So, I thought the first issue to be settled was the fact that there were no new Scriptures. If the canon was closed, as I had been taught, then the Book of Mormon was false doctrine. I remember early on calling one of my pastors for help. I just couldn’t figure out where in the Bible we derived the fact that the canon was closed. No matter how hard I looked, I couldn’t find a passage that even hinted. To the contrary, I found verses such as I Thessalonians 5:19-21 “Quench not the Spirit. Despise not prophesyings. Prove all things: hold fast that which is good.”, and Amos 3:7 “Surely the Lord God will do nothing, but he revealeth his secret unto his servants the prophets.”, and Hebrews 13:8 “Jesus Christ the same yesterday, and today, and for ever.” To me it looked like there was still precedence for God to speak. After a brief conversation with one of my pastors he admitted there is no Scriptural support for the closing of the canon.When I asked why we believed that his response was church tradition. Church tradition? Really? Isn’t that in part what the whole protestant reformation fought against. Didn’t Luther himself say he had to be convinced by Scripture to change his mind on his beliefs? Now I’m supposed to go to Neil and cite church tradition. Not likely. That conversation opened up the possibility to me that there could be new Scripture. Now my job was to find out if it was. Just as Thessalonians taught, I needed to “Prove all things”. As we met, there were several differences in doctrine that I had to examine and try to discern which was true. Some of the first that came up were the need for baptism as a requirement of salvation, the doctrine of the trinity, the continuation of an actual line of priesthood, as well as the laying on of hands for receiving the Holy Ghost. There were many others, but those are the main ones that come to mind. I would ask my questions and Neil would photocopy chapters from Articles of Faith andJesus the Christ by James Talmage. Eventually he just handed me both books to borrow, siting the need to save trees. Funny guy. Now I had more material to read as I studied. One Thursday afternoon Neil called me on the phone and asked if he could invite some sister missionaries to come and watch my children while we talked, so we wouldn’t be so distracted. I agreed, not knowing there was a rule that missionaries couldn’t watch children. When I arrived for lessons that evening with my list of questions Neil casually mentioned that he also invited a couple of elders. So, by the time lessons ended, the children were playing quietly in the back room by themselves, and I was sitting around Neil’s kitchen table with five Mormons, four of which were missionaries. It was slightly intimidating to say the least. I was afraid my questioning things would come across defensive, or worse offensive, but the missionaries were always gracious and understood my motives. This went on for close to three years. I went through many wonderful sets of missionaries, some of whom I became quite close to, such as Sisters Trachmann and Plourde. Occasionally Neil would invite some other ladies from his ward to sit in on the discussions to introduce me to some women from the church as well. One of those ladies, Vicki Lorimer, later became a lifeline for me. There were times I had a greater understanding of things than others. I still remember the day I was reading my Bible and realized we are supposed to receive the Holy Spirit by the laying on of hands, the only prerequisites seeming to be repentance and baptism. Well, I didn’t want there to be any part of the Bible I wasn’t at least trying to obey, so I came up with what to me was a simple solution. I emailed Neil and told him I now understood that we had to receive the Holy Ghost by the laying on of hands. Seeing as I had repented and was baptized, and he held the authority to lay hands at his church, maybe he could confirm me after lessons that week. Then I’d be set. Looking back at the naivete of that suggestion, I wish I could have seen Neil’s face when he first read my earnest email. Neil tried hard to explain to me why that wouldn’t work, but I just wasn’t getting it. However I did realize that Neil would be breaking some rules to comply to my request and I certainly didn’t want to get him in any trouble. I would just have to content myself with continuing to study and determine the truth. When this all began, I was sure I was right. I would faithfully ask my companions in my ladies ensemble group to pray for “my Mormons”. Hoping they would come to my faith. Eventually, however, I began to realize there was a very strong possibility that they were right. I didn’t dare say anything to anyone at church about my doubts. It would get me in a tremendous amount of trouble. The boldest I would get in sharing my doubts was to change my prayer request from praying for “my Mormons” to asking for wisdom. My daily prayers changed from, “Lord, please help Neil understand the truth” to “Father, please show both of us what is true.” I figured that covered it either way. I began to grow uneasy. I felt my whole foundation crumbling underneath me and I didn’t know where to put my feet. My whole life revolved around my faith. I realized I had started on a path that could not be retracted. I now HAD to know which was true. In the meantime my friends began to notice my uneasiness. Some of them wondered if Neil had too strong and influence over me. They knew I thought highly of him, and that my marriage was not easy. I assured them that was not so. Still, they were uncomfortable by what they now considered my fascination with Mormonism. Brent, my husband, also became concerned. Not about me and Neil, but about what he perceived as my defense of Mormonism in our discussions about what I was learning. When one evening I refused to say I was convinced Mormonism was a false religion he hit the roof. He told me I was no longer to read, study, talk about, or even think about Mormonism again. I was ordered to return all the reading materials and limit my conversations with Neil to life and piano. Religion was not to be brought up again. I was devastated, but I submitted. The church I attended taught that wives were to submit to their husbands in all things. There was a clause in there that said we could not be ordered to sin, but I wasn’t sure this fell into that category. I returned everything to Neil (except my Book of Mormon which I kept hidden under my mattress) and explained to him we would no longer be able to discuss theology. Neil took that in stride and went back to our discussions revolving around piano. I however, did not fare so well. I was truly confused about what to believe. What if God was different than I had been taught? What if there was more Scripture, and a whole line of priesthood authority and blessings that came with that? If that was so, I was not obeying God as He wanted. Possibly I didn’t even know him at all. What if I was teaching my children incorrect theology? Every decision I made was now suspect. Plus, so much of our daily lives revolved around the teaching opportunities I had with my children. Even our academics in our homeschool were saturated in theology. Every part of my life was shrouded in doubt. I began to fall apart and didn’t know how much longer I could continue in that state of mind. I begged my husband to allow me to continue to study. I pleaded with him to understand I had to know what to believe. He kept saying he would tell me what to believe. As submissive as I am by nature, I knew that wouldn’t work. I explained to him it had to be my beliefs, not his, but he wouldn’t budge. I felt close to a nervous breakdown. He grew angrier and more resentful of me because I could not seem to get past this desire to study further. Things kept getting more and more tense in our home. I was still submitting and not studying or discussing things, but I was absolutely miserable and felt completely pulled into tiny pieces. Eventually one of my friends, ironically the colleague of Neil’s that told me to go to him in the first place, went to the leadership of my church and told them she was concerned about a relationship I was in with a Mormon male. Brent and I were summoned to one of the elders homes to meet with he and his wife. There I was told of my friend’s concerns. I was also told that I was no longer to take my children to piano lessons. Brent and I were both furious. First they implied that there was impropriety going on, which we all knew to be untrue. Brent said if the husband of the home was not concerned about the friendship than neither should they. They said it was their final decision. Either I discontinued taking the children to Neil, having no further communication with him, or I would be kicked out of choir, orchestra, ladies ensemble, and my teaching responsibilities. I was devastated again. Who could I replace Neil with for my son? There wasn’t another qualified teacher within hours of driving. This time I dug in my heels. I told them if they could find a suitable replacement for Dillon’s instruction that I would switch teachers. But, I certainly didn’t think they had the right to determine who was to be a family friend. They disagreed and I was officially kicked out of the ministries at church. They replied that even if there was no impropriety, which we all now agreed there wasn’t, it was irresponsible for me to expose my children regularly to a Mormon. I left the meeting angry and feeling completely defeated and hopeless. The fact of the matter was, I wasn’t even sure Mormonism was true, but I certainly felt the need to find out. When Brent and I left that meeting we were both in agreement that the church leadership were overstepping their bounds. They didn’t have the right to determine our piano teacher. It was a few short weeks later that we were summoned to another meeting. This time I was to face the entire elder board, which consisted of about 16 men, both vocational and lay leaders. In the meantime, the pastors kept busy by interviewing my friends, asking them if I had ever said anything to them that could be deemed suspect regarding my beliefs on Mormonism, or my friendship with Neil. They really couldn’t find anything except the fact that I spoke of him highly. Once in the meeting, they began by reading a passage for the purpose of “setting the tone”. The passage they chose was one on church discipline. I knew from that moment on I was in step two of the excommunication process. I was flabbergasted. In the fifteen years I had served at that church, I had not so much as even gave the appearance of causing problems. Why were such drastic measures being taken? The meeting itself was humiliating. The men were hostile, and treated me as someone unworthy of even decent kindness. Every innocent action, or word ever spoken was scrutinized and looked at with the most vile slant possible. I was asked to defend how I could justify allowing someone to mentor my son who was Mormon. It didn’t matter how many times I said he was teaching piano, not theology, they still disapproved. Next I was asked to defend my interest in Mormonism. I didn’t want this fight. I wasn’t even sure Mormonism WAS true. I explained to them that Brent had told me to return the materials and stop studying, and I had submitted. Still they were unsatisfied. The meeting went on for about three hours, with the conclusion that I was to renounce anything to do with Mormonism, including taking the children to piano, or they would go forward with my excommunication. I was frustrated beyond belief. Whenever I tried calling a friend to talk about the situation, they would tell me that the elders had already contacted them, and they were not allowed to discuss the situation with me. I was also told if I needed to talk about it, they were to tell me the elders were available for me to speak with. I felt trapped. In the meantime, the elders (and remember, this is different than LDS elders) summoned me to another meeting. I had no intentions of repeating round one, and said that my position had not changed and refused to attend. Brent, however, grew frustrated with my inability to say Mormonism was false and decided to attend the meeting himself. At that meeting, Brent’s leadership of our home was called into question. He was even advised to disable my van, so that I could not take the children to piano. They told him, it sounded to them as if the Mormon in Conway was leading our home. Brent came home from that meeting more hostile than ever, and was now was in full agreement with the leadership. I was under immense pressure. My whole life was falling apart, and I wasn’t even sure it was for a good reason. Brent went to work in silence, and then came home and yelled at me for not submitting to the elders. When I went to church, I was not allowed to participate in any of the ministries, and I was whispered about and avoided. I had finally reached my breaking point. I wrote a local Mormon Bishop who had heard about my situation and asked Neil if there was anything he could do to help. I told him in the letter that I had so many questions and wished I could speak to him about them. I knew I wouldn’t be permitted to, so just asked for him to pray for me to have wisdom. Brent apparently had been going through my computer files because he found the file of the letter and went ballistic. I was now to give him my email password so he could check all of my computer correspondence. He also would not allow me to have a phone conversation without him listening in. I was falling apart. There were days I did not feel as if I could continue. I went about the house barely functioning, superficially going through the motions with the children’s school work, and then going to my bed to cry. Several times I came close to suicide, but thoughts of my children kept me from following through. I tried explaining to my husband how desperate and alone I felt. I even told about wishing to die. He responded by saying my sin brought all of those feelings upon my head. If I would simply repent, it would all go away. I knew I was completely alone. My husband wouldn’t help, my friends wouldn’t speak to me, and I wasn’t sure which God was real, the one from my church, or the one from Neil’s. My one lifeline was a woman Neil introduced me to from his ward, Vicki Lorimer. She must have sensed how desperate I felt, because she would email daily checking on my state of mind. Because she knew Brent was monitoring my emails, she would often put the subject heading as Scrapbooking, or some other girly thing, so as to not bring it to his attention. Those emails helped me feel as if there was another human somewhere who cared about me. I’m not sure if I could have gotten through those months without them. Things were now getting so tense at church, that I began to refuse to go. I couldn’t bear it any longer. Brent continued to attend and take the children, meeting with the elders regularly about my “lack of repentance”. One Wednesday evening Brent took the three oldest children up to church. I kept our two year old home, who had a 102 degree fever. A few minutes after Brent pulled out of the driveway, three elders (one full time pastor and two lay leaders) showed up at my door. They were there to give me one final chance to repent. So, while trying to comfort a very sick toddler, I spent the next two hours again having to defend my desire to study Mormonism. I realized throughout the evening, to my surprise, that every time they brought up some Mormon “heresy”, I had a response as to why it could be a true doctrine. I was honest with them that I wasn’t sure what was true, but did feel I had the right to figure that out for myself. They strenuously disagreed, and truly could not understand my refusal to submit. I was handed a letter that told me I had until the following Tuesday to repent and submit to the elder board, admitting Mormonism was a false religion or my excommunication would go public. I truly didn’t know what to do. I just couldn’t agree to what they were asking. One afternoon, while Brent was at work, Vicki called and explained to me about Unrighteous Dominion. 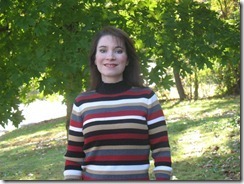 She helped me understand that it would not be a sin for me to disobey Brent and figure out what I believed. I knew I couldn’t continue in the state I was in anyway much longer without having a nervous breakdown, so I came to a decision. I announced to Brent one Sunday afternoon, that if I was going to get in trouble for Mormonism anyway, that I might as well study it and figure out if it was true. He was not pleased, to say the least. I was told it was time to make a decision- him or Mormonism, because he could not stay in our marriage as it currently stood. I was angry. I told him time after time that I wouldn’t even be able to join the Mormon church without his permission. I wasn’t asking to be a member, I just wanted to figure out what I believed. He still patently refused to allow me to study. I had submitted to him our entire marriage, even obeying when he told me what I was allowed to watch, or what I could eat. The one time I needed to disobey for the sake of my conscience and well being, he couldn’t give in. I decided I could not continue to live like this. We agreed to a divorce. I was to file, because divorce is forbidden at our church and I was getting excommunicated anyway. Shortly after our agreement, my excommunication went public. At my former church, excommunications are finalized in front of the entire congregation. The pastor spent about twenty minutes speaking about me, telling the congregation I was under the influence of a Mormon male and had abandoned my family. They were told that the elders had loved and pleaded with me to return, but I had refused. There instructions were to now treat me as an unbeliever. Any communication they had with me should be designed only to call me to repentance. I was ostracised. A few weeks later Brent moved out. For the first time in over eighteen years, I was alone. I felt that way too. I was so scared. I had no means of support, four children I loved more than life itself, and I had no idea which theology was true. I think if I had an idea of who God really was it would have helped. At least it would have given me some direction in where to place my trust. At that moment I wasn’t sure who to trust. For three years I had prayed and studied faithfully (until forbidden). The missionaries had assured me if I prayed sincerely, God would tell me what was true. I could not understand why He didn’t answer. I was as sincere as it was possible for any human to be. Was there something wrong with me? Was I not good enough? Was I committing some sin I was unaware of that kept Him from answering me? I didn’t have any answers, and I really needed some fast. During my 3 + years of study I read A LOT of material. Not only did I go through the entire book of Mormon, but I read Articles of Faith, Jesus the Christ, The Inevitable Apostasy (probably the most helpful book to me), and countless talks that my friend Vicki would send me to try to help answer questions. It was during one of these talks that I first experienced what I now understand to be the “burning of the bosom”. I would often get frustrated in my conversations with missionaries when they’d ask me questions such as, “How does that make you feel?” I kept thinking, “Who cares how I feel about it? All that matters is whether it is true. I can think something sounds wonderful, but that doesn’t make it true.” I was so frustrated. Plus, I came from a doctrinal background where feelings were taboo. Discernment was done strictly through the Scriptures. If the Bible says it, than it is true. Period. No feelings can verify anything. Having the Spirit affirm something was completely foreign to me. Gradually, the Lord helped me understand. Although revelation is something that I am coming to learn will be a life long process. One of the first things that helped me, occurred while reading one of the talks my friend Vicki sent by email. I don’t even remember the topic of it. All I remember is standing at my computer, reading the talk, and feeling my whole chest burning in a way I will never forget. It was a beautiful feeling, and every ounce of me felt like the Spirit, or something, was affirming the words of the talk. The topic wasn’t new doctrine for me. Everything in that talk my former church would have agreed with. But, the experience was new for me, and was the beginning of me learning what it means to have the Holy Ghost commune with you. It startled me at first because it strengthened my suspicions that there was much more validity to Mormonism than I ever considered. I knew what that would mean for me and I was frightened. The second big milestone for me occurred while reading The Inevitable Apostasy by Tad Callister. If you’ve never read that book, I highly recommend it. I knew there was an “elephant in the room” regarding Mormonism that I had yet to address….exaltation and godhood. I tried addressing it that first night I spoke with Neil about his faith. I asked him if he believed he would be a god. He didn’t answer my question (no big surprise there). Instead he asked me what would happen if he asked Dillon to play Tchaikovsky’s hardest concerto. I said it would be too discouraging for him. He said that is what would happen if I tried to understand deep doctrine, before getting the basics. To be honest, I wasn’t convinced. I thought he was avoiding answering me. But, I knew Neil well enough to know that if he didn’t want to deal with something, there was no point in continuing to try. So, I dropped it. However, privately, I knew that would have to be addressed before I could make ANY decision regarding Mormonism. In the meantime, as I was praying and studying, I realized that I tended to read the Scriptures through the lens of the theological interpretations I had been taught and personally developed. We all have bents and biases that affect how we interpret things, even our Scriptures. I then began making a very conscience effort to re-read my Scriptures with a blank slate. I tried to pretend I had no theological knowledge or background and was coming at the Scriptures fresh. I was amazed at the difference in understanding you can have if you just took Scripture for what it literally said, without spinning it through your preferred, or learned doctrinal preferences. That prepared me for what I was about to learn. I was sitting on my couch reading Tad Callister’s book, when I got to a chapter on deification. It was amazing! He did such a great job taking you through the Scriptures and the ante-Nicene father’s writings in such a clear way. It opened up that doctrine for me in a way I had never previously understood. I also learned that the doctrine is not quite the same as what we are taught in anti-Mormon literature. However, it was still in its actual form quite different from anything I had ever been taught before. As I was sitting there, I suddenly said aloud, “I believe this.” And then I thought, “Oh no! I believe this.” I knew there was no turning back. I had to follow through and see if it was all true. All during this time, I felt like I was on one of the scariest roller coaster rides of my life. I would read and study the Scriptures and other books and really feel like things were true. Plus, I fell in love with the faith itself. It is so beautiful, so heavenly. So there I was riding the coaster up, feeling the tension the whole time between the two belief systems. Then, I could have a five minute conversation with my husband and come plummeting down. I was terrified that he was right and I was falling for a cleverly devised Satanic deception. I was trapped between belief and fear. If Brent was right, and I believed Mormonism, I would be condemned to an eternity in hell. If Neil and Vicki were right, and I didn’t believe Mormonism, I would not know or obey God as He intended for us to know Him. I was being completely overcome by fear in both directions. And that was the state I was in when my husband moved out. I still remember my first weekend without my children. I had never really been without my children for any significant period of time before. In the eighteen years of our marriage, Brent (my ex) and I had been on a total of four dates, and they were short. The longest I had been away from any of my children were the times I was in labor having another one. Try as I might, I have a hard time counting that as time away. I spent the entire weekend crying. I did NOT want to be alone, but no longer had any friendships to call on. Neil is not the comforting type, and Vicki had family obligations that weekend. Coincidentally, that was the same weekend as General Conference. I did try to watch some of the talks on my computer, but always ended up crying so much I couldn’t see or hear anything. I remember several of the talks being about trials, but was having a hard time applying them for some reason. To be completely honest, I was still afraid I had made a wrong decision by refusing to submit. What if it turned out Mormonism was not true and I had sacrificed everything for nothing? Soon I started receiving letters from members of my former church. All calling me to repentance, and telling me I was taking myself and my children on a path to hell. It was very frustrating. Not one person was willing to hear my side of the story. They felt they knew all the information they needed from my excommunication announcement at church. When I ran into church members in a public arena, I was either ignored completely, or told to repent. Even the woman who had been my best friend for quite a few years, pretended we had never even met when we unexpectedly ran into each other. It was infuriating, but I had too much on my plate to focus on their behavior. The next emotion to hit me was panic. How was I going to provide for my family? I didn’t even have a college degree. When Brent and I first married we were both going to school. Brent, however, made the suggestion that only one of us go at a time. (I no longer remember why, because he didn’t want me working outside the home anyway. Maybe to cut down on tuition costs?) Our agreement was that he would finish first, as he would be the primary breadwinner. When he was done, I could return. I agreed because, at the time, it seemed to make sense. The problem was he took seventeen years to go, and then quit with nothing left but his master’s thesis. As a result, I never got to return. Plus, there is NOTHING more important to me than my children. I did not want to give up raising and educating them. I needed to find a way to earn money and still be their mother. To add fodder to my fear, all my math students were from my former church, with the exception of one family. All the families from my former church dropped my classes. I remember calling one of the mother’s in desperation, begging her not to drop my class. I wasn’t teaching theology, I was teaching math. She absolutely refused, citing there was no way she would let her children study under me now that I was Mormon. I reminded her I wasn’t Mormon, I just felt I had the right to study it and examine my belief system. She told me I lacked character and this would be the last I heard from her. I was angry and afraid. In frustration I snapped back, asking her if it showed character to allow my children to starve because she didn’t agree with my theology? She hung up. Her attitude was not uncommon. I heard the same things time and time again from the parents. They didn’t feel I would be a good influence on their children. On top of that, the general manager of one of the two magazines I wrote for every month was a former member of my old church. I thought because he was a former member, there wouldn’t be any issues, but once word of my excommunication leaked to him, suddenly there were no more articles available for me to write. I called and asked if I could do advertising sales, volunteering to work on straight commission. That would not cost him anything. He refused even that. I spent nearly every waking minute trying to find ways to earn money and still raise my children, but was not having much success. At some point a couple of things began to work out. The other magazine I wrote for was also run by a woman from my former church, but she was kind of dependent on me. She decided to keep me on. That was at least some income. Then an acquaintance who owned a recording studio agreed to let me do some odd jobs for him, as they became available. With those two things, and me querying other magazines for work I should be able to squeak by. We’d need food stamps temporarily, but we would survive. I began to relax, and could now focus on whether this church really was true, or if it was time for me to reserve my spot in hell. At first it felt funny reading the Mormon scriptures in my living room. It had been forbidden for so long at that point, that part of me still felt like I was doing something naughty. Eventually I got past that, and in my spunkier moments would say aloud, “Oh look, Brent, I’m reading the Book of Mormon.” I decided it was time to take the next step. I was going to attend a Mormon church service. In order to take all precautions with my children, I waited until the next weekend they were with their father. I was shaking like a leaf that first Sunday morning. I did not know anybody (Vicki and Neil attended a ward in a different city) and none of them knew me. It never even occurred to me to call that Bishop that had contacted Neil those many months ago. When I went into the chapel, I sat quietly by myself and looked around at the people. There was one woman in particular, Lanniece Lewis, who had the most radiant smile. Looking at her helped me relax a little. I spent the entire sacrament service praying, begging God not only to help me know what was true, but to help me know how to order my family correctly and provide for them. (Things had gotten a little out of control with the children while I was trying to drum up work). I was very concerned about order and provision. The next significant memory of that day was relief society. My shaking was getting a little worse, and I felt very alone. One thing I remember very clearly was the practice hymn. They sang Be Still My Soul. I had never heard that hymn before, but my heart nearly leapt out of my chest when we sang the line: “Leave to thy God to order and provide”. That was exactly what I had been praying about just that morning. It made me feel like God was listening to my prayers. Maybe I would even know soon, whether or not the church was true. The lesson ended up being on Joseph Smith and the trials and sacrifices he went through when he told people of his newfound faith. Tears began streaming down my face uncontrollably as they talked about Joseph’s struggles. There was something in his unshaken confidence I longed for. I wanted this church to be true. I thought it was beautiful, but I could not join a church on that alone. I would need to know that was what God wanted me to do. I wanted his confidence. I was becoming more obvious (to my great dismay), as my sobs grew. I couldn’t stop the tears. I wanted the ground to open up and swallow me. I was so embarrassed. The teacher kept looking at me with compassion and I just didn’t know what to do. Finally, I raised my hand. I told the ladies I wanted so much to know if the church was true. Before I knew it, all the fear and agony came pouring out of my mouth. I told them everything. I told them I was scared. I wanted to know, if I was going to have to sacrifice everything, that it was for righteousness and not deception. The ladies were so gracious. Many of them came up to embrace me and tell me why they knew the church to be true. Even if my testimony did not become sure as a result of their comments, it was at least comforting. I went home renewed in my efforts. I began studying with great vigor and began meeting with the missionaries. They came over at least once a week and would answer questions and eat dinner with us. With my husband gone, there was no longer anyone telling me on a daily basis that Mormonism was a satanic deception. Gradually, my fear began to lessen, which opened up my ability to feel assurance from the Spirit. We are told all the time that fear and faith cannot co-exist, but it is so hard to get rid of fear sometimes. At least it is for me. 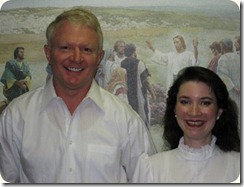 I began to long to get baptized, but was afraid that I could not without 100% assurance. One night after dinner, Elder Bird looked at me and said, “Annmarie, why haven’t you gotten baptized yet?” I replied I didn’t want to make God angry. I thought it would be hypocritical to get baptized without a 100% assurance and understanding. Elder Bird replied, “Annmarie, I am a representative of God, and I can completely assure you that God will not be angry with you if you get baptized.” He then told me he felt led to read a verse to me. Turning to Ether 12:6, he read, “And now, I, Moroni, would speak somewhat concerning these things; I would show unto the world that faith is things which are hoped for and not seen; wherefore, dispute not because ye see not, for ye receive no witness until after the trial of your faith.” At first I cringed, “until after the trial of your faith”. Wasn’t this enough of a trial? Was there to be more before I received a further witness? Then, suddenly, it hit me. The trial for me is not having 100% knowledge. I’m the kind of person who wants ALL the information. I want to study everything out ahead of time. I would never go to a test unprepared, and what could be more important than eternity? I opened up my Bible, and the first verse my eyes laid upon was, “Beware of false prophets.” My heart stopped. Then something said to read on, so I did. Later in the passage it said, “You shall know them by their fruit.” It was as simple as that. Peace flooded my soul. I have studied this faith and the life and teachings of Joseph Smith for years now, and I knew the fruit. I went to my baptism with 100% confidence. Something I never thought I would have. Nothing felt as good as being submerged in that water. I became a Mormon on May 9, 2009, and was confirmed on Mother’s Day, May 10th. It hasn’t been easy since then. A few months ago, the magazine I wrote for on a monthly basis fired me. She was the majority of my income. 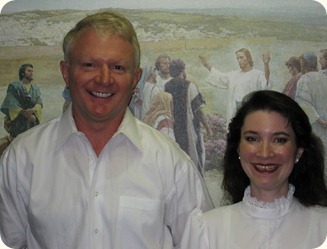 I knew her attitude toward me had changed after I got baptized, but she was happy with my work, so I felt safe. Apparently she was biding her time until she found a replacement. Eventually, when she found one, she stopped assigning me articles. When I asked her about it, she said she needed someone with a college degree. She even admitted my writing was better than her new staff member. My only guess, as I had not needed a degree previously, is that the pressure, or guilt, became too much for her to handle at church, and it was easier just to let me go. So, I’m back to square one in earning money. There are other pressures too. It is hard being a single parent. I’m tired all the time, and the loneliness can be overwhelming. But, I can say with total assurance, that I am right where God wants me to be. I have learned so much in the last year, that my heart often feels like it is already in heaven. Of course, the realities of life quickly remind me I’m still in the telestial world, but I won’t always be.